Marked cards can be used in the various situation and favored by the poker magicians or illusionists with the magic poker tricks. As the name implies, marked cards are the deck of playing cards which have been marked with invisible marks by a player who is preparing to cheat or a magician who is ready for making poker trick show. There are some alterations on the reverse of each piece of card, by this way, the poker player can recognize the suit and number of that card. But, if you don\'t have any professional luminous ink reader (such as marked cards contact lenses or poker cheating glasses), the marked cards just only a normal deck of cards at the table and the secret of them is invisible, even you pick up those cards and check them carefully. Marked cards are playing cards which look identical to the standard 52 or 40 cards deck, but the user can identify the exact value and suit of each card which has been tampered with by the user in some way. In the beginning, the main purpose of developing the marked cards is for cater to the demand of poker magicians and illusionists who need magic marked cards to read and learn the marked playing cards to play their card tricks. 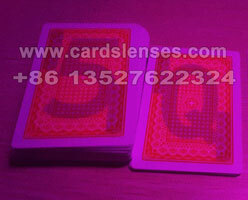 Most of the classic card reading tricks are often done with these magic marked cards. 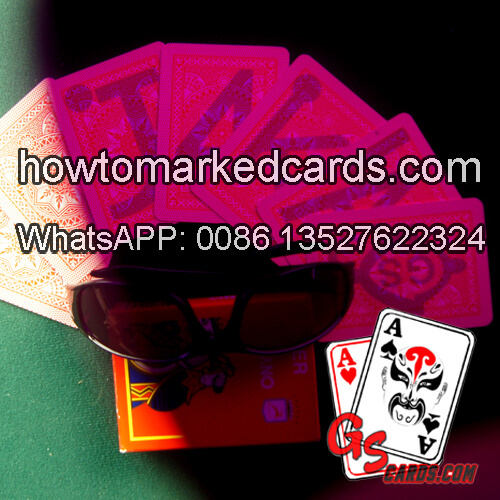 Marked cards are also used for poker card games or after hours playing cards games. With the advantages of the marked deck cards, the user can get more odds in his favor. If you are a dealer and have a partner in the game, it is very convenient to change the marked cards to replace the ordinary one at the poker table and benefit to your partner; if you are a player, it is very difficult to change the poker cards are marked, but, nothing is impossible. Benefit from the high security of the marked cards, they give the user a great advantage without arousing any suspicion during the playing card games. Same as other things, marked cards also have pros and cons. Card cheating at many countries and occasion is prohibited and user may be punished by the local authority as they use against the fairness of the game. However, marked cards are a good kit for casinos to guard them against any fraud and ensure each player has a fair chance to play the poker card game in their rooms.